‘Car Trouble’ or Who was in the Boot with Parkinson’s? 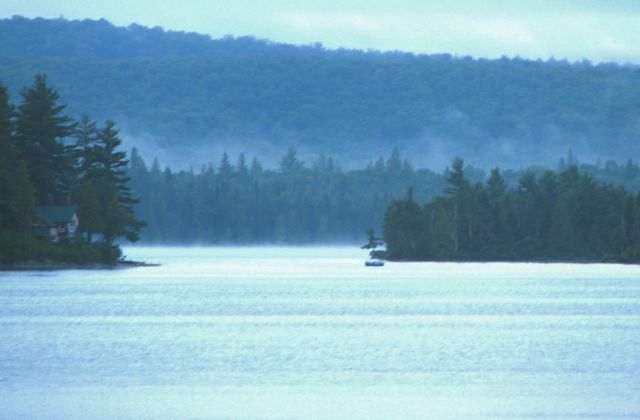 It is a rare occasion indeed when Ottawa, Ontario (at the confluence of the Rideau, Ottawa and Gatineau Rivers) is mentioned in the same breath as Lake Kawawaymog near South River/Algonquin Park in Ontario, and the Assiniboine River near Treherne, Manitoba. The straight line distance between Lake Kawawaymog and Treherne is approximately 1,502 kilometers (934 miles.) 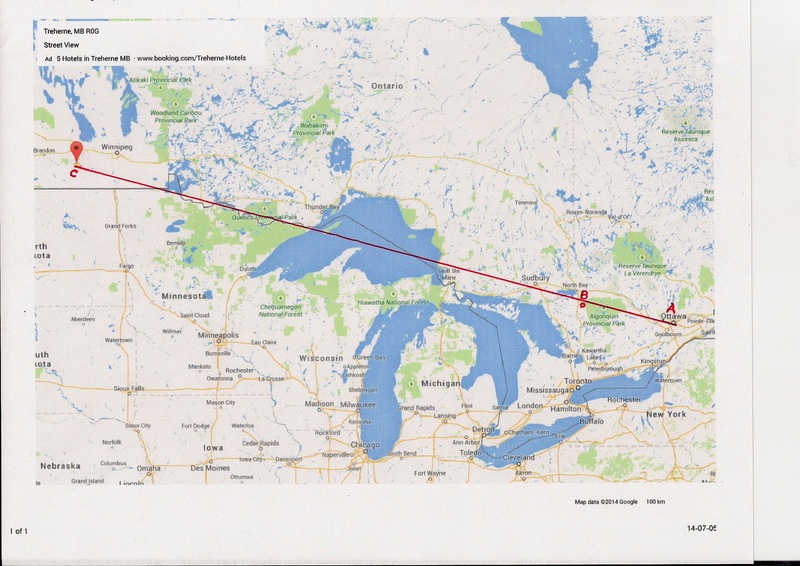 The straight line distance between Ottawa and Treherne is approximately 1783 km (1108 miles.) Interestingly, a straight line from Ottawa to Treherne runs almost directly through Lake Kawawaymog. Other than having this interesting geographical juxtaposition, their waters never intermingle directly, but a strange thing happened last week. A time – space continuum was breached, as my thoughts traveled to our immediate destination (Lake Kawawaymog) and kept on traveling straight to Trehere not only across 1783 km but also back through 57 years of temporal space. No, I was not hallucinating because I have Parkinson’s disease and although Parkinson’s was along for the ride, it just wasn’t driving as usual. And yes, the levels of all bottles in my stash of scotch remained constant so there is no blame to be directed there. Please bear with me. I can explain but you will have to be prepared for a somewhat circuitous route. Anne and I were embarking on a relatively short journey (51/2 hours or so) from our home in Ottawa to Anne’s sister (Wendy’s) and brother-in-law (Ger’s) cottage on Lake Kawawaymog. My own sister (Ger) and brother-in-law (Terry) were accompanying us as we were to drop them off en route at Terry’s sister’s place. Regular readers probably realize that I do not often reveal names beyond my immediate family on the grounds that some of them are, in fact, innocent. But in this case, in order to avoid confusion, I need to note that both my sister and my wife’s sister’s husband respond to the name “Ger”, one being Geraldine, and the other Gerald or Gerry. Fortunately for us they seldom are in the same room together, but they are included in many sometimes confusing conversations. On Highway 17, some twenty minutes west of the City of Ottawa boundary, our trusty hybrid vehicle (make, model and year withheld to avoid any possible litigation) decided to pack it in. In the old days when a vehicle died it just stopped running, or made some horrible grinding, mechanical noise. In this case, when I kicked the accelerator to pass a slower vehicle in front of us and to avoid a faster vehicle which was intent on riding up our rear end, the hybrid cried out electronically with a cacophony of bells and whistles, and a plea for us to “pull over and stop safely” appeared in bold text across the dash in front of me. Further attempts to rouse the engine and transmission to their respective tasks went unheeded. We slowed and coasted to a stop on the gravel apron. We sat in disbelief for a moment and then I did what every human is programmed to do – reboot. I again started the car, put it in gear and pushed carefully on the accelerator. Toying with us, the hybrid got back up to speed, but then quickly relapsed into ‘I ain’t going nowhere mode.’ The four of us sat somewhat stunned as the realization that our routine trip was going to be anything but routine. While we gathered our wits, I did have some fear that this situation would trigger an attack of Parkinson’s tremors and accompanying pain in my left foot and leg. I do suffer from persistent pain but it had been largely under control on this trip barely registering a 2 or 3 on my 10 point scale. And stress, even of the most innocuous sort, usually precipitates such responses. I need not have worried. It didn’t develop. But more on that later. ‘Car trouble’. Those words rolled around in my brain with a familiarity which surprised me. When I was a very young boy, ‘car trouble’ followed us around like the black cloud over Joe Btfsplk’s head in L’il Abner. In the late 1940s and early 1950s my parent’s traveled the highways and byways of Manitoba in at least two different Austin Healey cars. And funny little cars they were. Turn signals were not yet in common use on many vehicles and hand signals were an obligatory part of the highway driving code. Winter was always chilling as wind and snow blew in the driver’s side window onto whichever poor child had the misfortune to have the rear left seat. Then came a breakthrough which sealed the Austin’s comical fate in my mind forever – electric turn signals emanating from between the posts of the front and rear doors on each side. Controlled manually from inside the net effect was that of little illuminated rabbit ears popping up and jutting out with each turn, and popping down when the turn was complete. I do recall that my father hated it when I would reach out of the back window and try to keep the ears from popping out. Fortunately, he could not swat me as I was in the seat right behind him and he never swore so I escaped immediate wrath. And he mostly forgot such things by the time we reached our destination. I recall my mother being in perpetual fear of breakdown especially on rainy days and on muddy roads, or during bone chilling minus 30C winter days. These are fears she carries with her to this very day. In winter, we children traveled under the warmth and weight of several itchy khaki blankets courtesy of my grandfather and my dad, and the military. To be fair to Austin Healey, ‘car trouble’ included getting stuck in snow or mud, dead batteries in the middle of winter as well as a variety of mechanical concerns ranging from inoperative windshield wipers, to frozen heating systems with no defrost, to holes in the gas tank from the pounding of gravel from the roads. A good road had gravel; a bad road had mud; both were dangerous. There were precious few paved roads. But, back on the apron of Highway 17 we were waiting for the tow truck to arrive to carry the hybrid away in an inglorious fashion, when the memory of a leaking gas tank on the old Austin flashed through my mind. I am not sure why, but maybe it was because it was also at the beginning of small exciting trip for me. I was a young lad of about eight. My dad and I were off on a day trip to go fishing in the Assiniboine River near Treherne, Manitoba. We rarely fished in the Assiniboine in those days, preferring to fish in the smaller Pembina River which ran closer to home. [This was before the days of torrential summer rains which flood large sections of Manitoba. How about that? I think I have lived long enough to document climate change in my oral histories!] Anyway, the fish in both rivers were mostly Northern Pike which we called “jackfish.” In summer, the river was warm and the fish sluggish and mushy. As you can imagine, sluggish, mushy fish taste like sluggish, mushy fish. The thrill was in the catching not the eating. Nevertheless, Dad and I were returning to the great meandering Assiniboine because a month or so earlier we had been fishing off a shoal on the shallow side of the river, casting our lures into the deeper waters eroding the far bank, when my lure was struck with a heavy hit from something large. It almost ripped the rod from my hands and the rapid retreat of whatever was on the other end caused the handles on the reel to rap painfully on my knuckles. As an eight-year old, I had no concept of how to skillfully play a fish for landing. The fish (I assume it was a fish and not some Assiniboine version of Ogopogo – Lake Manitoba’s answer to the Loch Ness Monster,) came back towards me just as rapidly and I cranked in the line. The fish then turned to make a second desperate escape bid neatly snapping the taut line, making off with my favourite red and white spinner and dashing my hopes of landing a really big one. If I were telling this to you in person, I would punctuate the story at this point with my arms stretched out widely. So, we were returning to the Assiniboine, somewhere west of the bridge on PTH (Provincial Trunk Highway) 242 and east of the bridge on Highway 34 in search of the “big one that got away.” I am not certain which bridge was called the “new bridge” and who knows, they maybe call it the “new bridge” to this day, some 57 years later, such is the unique passage of time on the prairies. Only we never made it – car trouble. Somewhere north of Notre Dame de Lourdes, we let it slip away. [Funny, these words evoke some notion of a Canadian version of “Me and Bobby McGee.”] Anyway, dad noticed that the gas gauge was going south faster than the old Austin was going north. A quick stop for dad to peer beneath the car, dust still billowing behind us and over our heads. The verdict: a small puncture in the gas tank. A new problem; never had this before. What to do? Perhaps it was too far to return to our home in Altamont? Besides, we both held out hope that it could be repaired and we could continue on our expedition. I also think my dad didn’t want to disappoint me. Dads are often like that. It was a Sunday. I know this because my dad only ever had full days off on Sundays. So we continued on towards a nearby farm. We pulled into the yard and into an open shop (a wood frame building as it was in the days before there were many steel Quonset huts.) I don’t recall much other than the farmer was nice (they usually are) and wore the obligatory coveralls of the day. The floor of the shop was a combo of concrete and dirt – hard to know where one started and the other ended – both covered with oily, greasy substances accompanied by that distinctive petrol smell. My dad and the farmer quickly discussed the particulars of the situation and jacked the car up with a hand jack. Yep, closer examination confirmed the original diagnosis – a small puncture in the gas tank. I recall my father not being happy about the quality of the steel of the tank and the fact that there did not appear to be any protective shield for the gas tank. What to do? There was a discussion about possibly welding the hole. Thank God this option was discarded quickly! A search for something to plug the hole ensued: rolled up paper – nope; rolled up cardboard – nope; small twigs – nope; some form of glue found in the shop – nope; gum chewed to a sticky mess by an eight-year old boy – nope. Combinations of the above – nope. Other materials were undoubtedly employed as potential solutions but none succeeded in stemming the slow leak. A decision was made to top up the tank and turn for home, disappointed that the day would end without a fish, or even a fish story. My father, being the methodical man he was, scratched out a rough equation in an attempt to determine the optimal speed to drive to be most efficient such that the amount of gas used by the motor minus the rate of leakage did not decline past zero i.e., we would not run out gas before we reached our home destination. All without speeding the poor Austin into the ditch or attracting the attention of the RCMP who patrolled those roads. I fear this mathematical learning opportunity was largely lost on me. We reached home safely and the “big one” got away once again. It was an anti-climax that the tank was repaired by sending it to Winnipeg. From that day forward, it always had an additional protective shield deflecting any gravel that would spit up from the roadbed. Meanwhile, back on Highway 17 modern technology was working exactly as intended. Using our two cell phones we called roadside assistance covered courtesy of Ger’s CAA card. [Note to self: get one.] A tow truck and taxi were dispatched to our location. After a short cell phone conversation with the service department, the hybrid was towed to the dealership for repairs. We searched the internet on our cell phones for the closest car rental agency, determined car availability and had the taxi deliver us and our luggage to that exact location. A replacement car was secured. Phone calls and texts to those at our respective destinations were made, took time for lunch, and we were back on the road with only a two hour delay. No one panicked – not even Parky. My Parkinson’s remained remarkably in check – no exacerbated tremor or pain for that time period or for the remainder of the day. Amazing! Modern technology, money of course, and the presence of mind of my brilliant sister to have a roadside assistance card, took most of the guess work out of this crisis. Maybe … but my past experience is that if Parky has an opportunity to screw things up, it will. So I am still left with the burning question: why didn’t my Parkinson’s act up and make life unbearable for me, if not for others? It could just be the reduced stress as noted above, or it could just be luck as Parkinson’s often is unpredictable with a mind of it’s own. I actually think that on this trip Parkinson’s was in the “boot” along with the luggage. As a kid I always laughed when the old timers referred to the trunk as the “boot” and the hood as the “bonnet.” The Austin had a boot, and a bonnet. Our current car trouble was under the bonnet and Parky was discretely packed away in the boot. (1) I have been reviewing for quite some time The Pain Toolkits produced by Peter Moore whom I follow on Twitter @paintoolkit2 and his website http://www.paintoolkit.org/ The toolkits and Peter’s encouragement on Twitter have been instrumental in my attempts to be in control. (2) I switched my physiotherapy approach to LSVT BIG and PWR (Parkinson’s Wellness Recovery) at Action Potential Rehabilitation http://actionpotentialrehab.net/ where my physiotherapist is Sue Goodridge. Even though I have only had a few weeks under this program I already feel that I am gaining a better understanding of both the mechanics and the theory of physiotherapy as applied to Parkinson’s. Such things as movement, flexibility, coordination and balance are among the keys to a better quality of life. Even simple exercises such as “splaying my toes” remind my feet and brain that my toes are intended to move that way. For too long my brain was sending signals to my feet and toes that they should remain immobile in some futile attempt to avoid or lessen pain. In fact the opposite – more movement – is required. Movement and exercise are critical for persons with Parkinson’s. Don’t get me wrong, I am in no way an expert in any of the above areas. I have only just begun this particular journey. We shall see where it takes me and I shall be blogging from time to time about these experiences and adventures. So far, I feel that there is real improvement and that my optimism is warranted. That being said, none of these programs, techniques or practices is as important to me as the love, encouragement, understanding and support of Anne, our four daughters and their respective husbands/partners. They are the fuel for the engine that keeps my old chassis moving – even if the bonnet and boot are too large. All of this rambling has been my usual long winded way of saying that I escaped what should have been a very stressful day as Parkinson’s was relegated to the ‘boot’ in the ‘car trouble’ affair. It was a pleasant drive with Ger and Terry to their destination, and good food, drink and stimulating conversation with Wendy and Ger made for a relaxing time when we reached our cottage destination. But, I have to tell you a secret. Parkinson’s was not alone in the boot. My dad and his mother Maud (my grandmother) were also in the boot. I am pretty sure they had never been held captive in the boot when they were alive, and I am also pretty sure that this was not an imposition for their souls and/or spirits at this time. Nevertheless, our vehicle was carrying two of the three children born to Kathleen and Bert, our mother and father. Perhaps, our father provided prudence to my sister Ger to purchase the roadside assistance card; our grandmother Maud was in the boot to keep Parkinson’s under her stern and intimidating watch (you met her in earlier posts); and my dad also would not have wanted our mother who hated car trouble to worry – she is still living and so could not be in the boot but she was likely huffing at Bethany where she lives in Middle Lake, Saskatchewan. How do I know they were with us? We were close to Terry’s sister’s where we were to drop Terry and Ger before we continued on to the cottage. 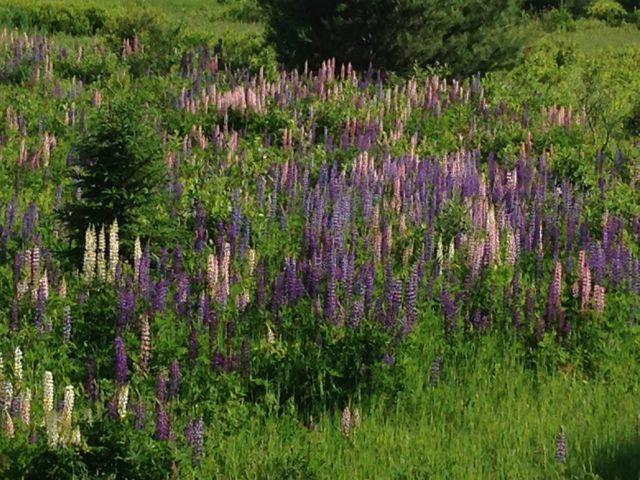 Turning a corner, a field of naturalized lupines appeared on the left side. Struck by such beauty I braked abruptly (no one behind thank goodness,) and jumped out of the car to snap a few shots with my iphone – chalk another one up for technology. At that point I knew that we were accompanied by someone who loved the passengers in this vehicle, who understood intrinsically the beauty of such a sight, and knew that I love lupines! As always, my experiences leave me with a bit of a mystery or intrigue that raises questions, sometimes philosophical. In this case, both my grandmother and my dad were colourblind! Not a life threatening condition to be sure but how could they fully know what they were seeing? Surely if they hadn’t experienced the full visual effect, they could not know that the striking natural beauty of the lupines would literally stop us in our tracks, sending a signal to us that all was well. But think about it. They were horticulturists by nature and experience, and their love and appreciation of Nature allowed them to transcend this disorder of being colourblind. I try everyday to use my dopamine assisted brain to transcend a neurological disorder called Parkinson’s to alleviate pain and tremor. And you know, it often works. I can only conclude that on this particular day, Parkinson’s did not stand a chance.